Among the Quirk papers auctioned in 2016 was the design for a medal. The medal has the title of “ART AND PHILOSOPHY” and features a toga clad man seated on a marble bench surrounded with scrolls. He appears to be deep in thought. We have no idea if the medal was ever cast and have found no reference to it on the internet. This may have been an academic assignment. We did find it interesting that with the medal design is some background lines that he used as a tool for aligning the elements. One salient feature is that he used the classic triangle to lay out the paintings key elements. An illustration of the esteem for the triangle being reserved for important subjects is the uproar caused by George Caleb Bingham’s The Jolly Flatboatmen. The painting is now in the National Gallery of Art in Washington. 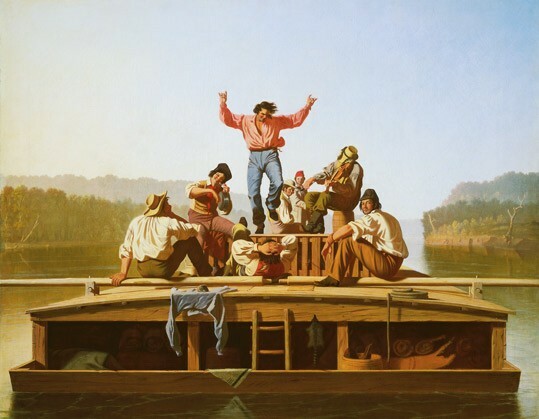 Bingham was known for his paintings of hunters, trappers and boatman on the Mississippi. But, he also executed some genre scenes around elections that were quite good as well. The triangle composition in the Flatboatmen caused a bit of a stir as some art connoisseurs asked, “How the painter could use this format of common working men?” Looking back, this writer’s view would be “That is exactly the point. These humble men are exulting in life and the arts. Is an honest day’s work not noble? Isn’t the joy of music and dance not noble? This is not the dance of the seven veils here.